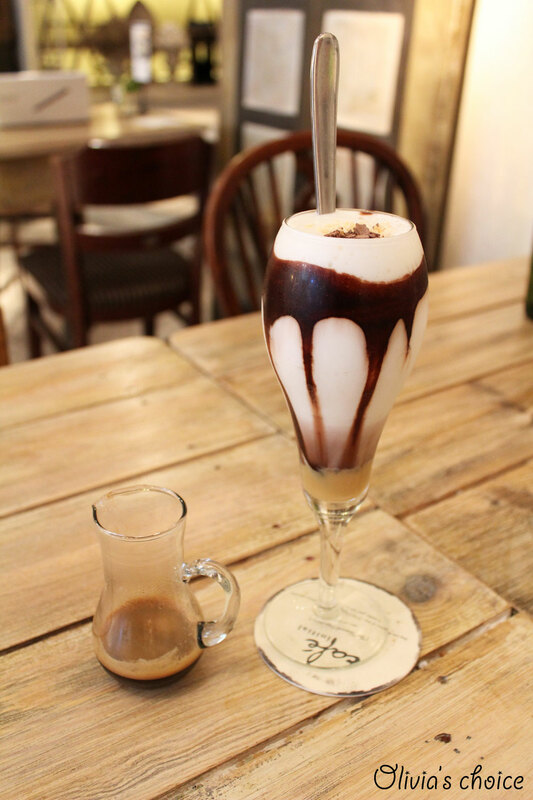 Hong Kongers, we have something to celebrate! 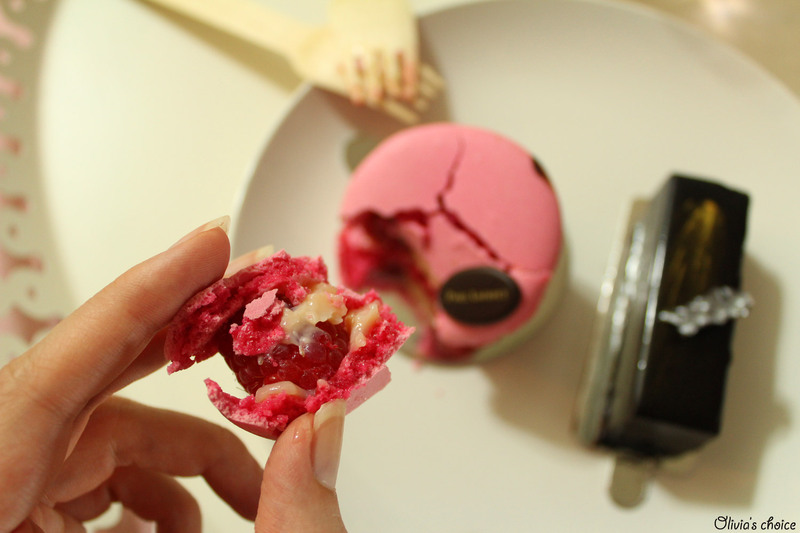 I've recently discovered another Ispahan in town! 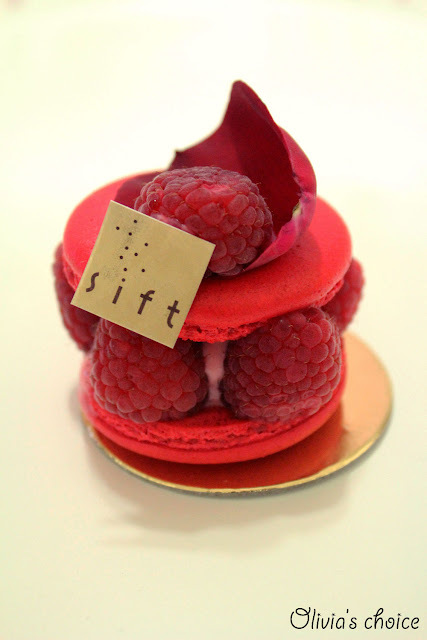 Remember how I got all excited upon discovery of Sift's Ispahan, and begged you to tell me whether other patissiers offered this delicatessen in Hong Kong? Well, about ten days ago, I visited the newly opened shopping mall in Causeway Bay, Hysan Place, to take a look at the new complex and see how I liked it. I loved it, and after only a week since its inauguration, you could already tell the place is going to be a success. I wandered around the shops, Jason's the supermaket, and the mesmerising Eslite bookstore, and then had dinner at Sen-ryo, the Japanese restaurant on the 12th floor. When I was about to go out in the Ground Floor, I saw Paul Lafayet has a tiny store in Hysan Place as well! It's mostly for take away, but there's four seats in the bar. 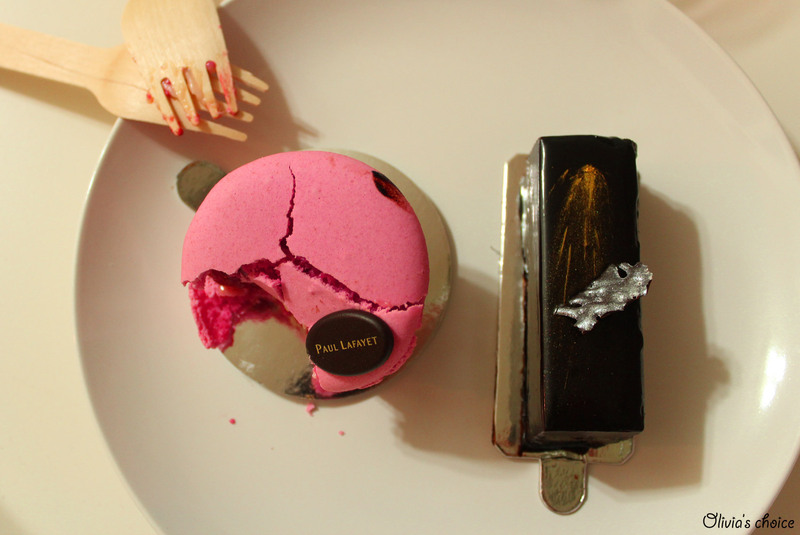 My eyes stumbled upon the Ispahan as if it was magnetised. Paul Lafayet calls it "Rose and Raspberry Macaron", so no "Ispahan" name there, but we all can recognise an Ispahan when we see one. This one doesn't come with the eye-catching details on top, namely a raspberry and a fresh rose petal, but the rest is the same. I liked the fact that the lychee was sweetened to the point that it lost all sourness. Since I don't like to eat lychee as a fruit, I enjoyed this sweet technique. Overall this Ispahan was delicious and I highly recommend it (5*). On an aesthetic note, I missed the details on top that I mentioned. 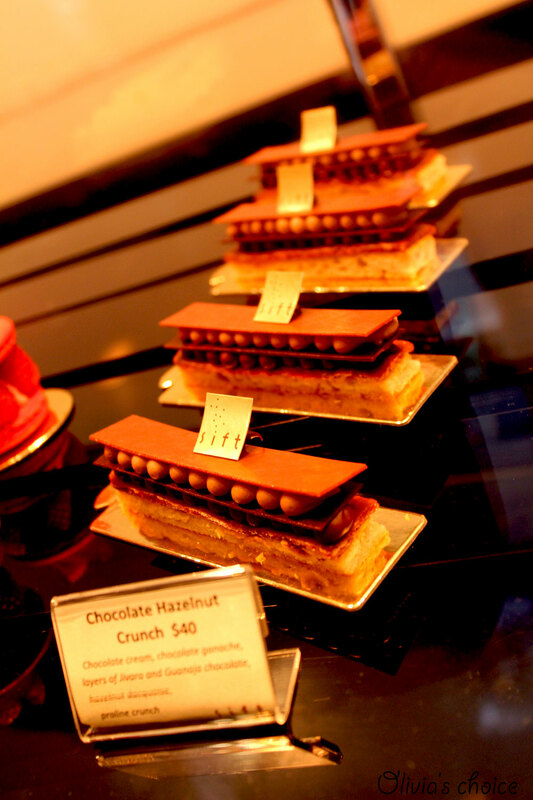 As you can see from the pics, we also had the Chocolate Craquelin (5*), a must-try for dark chocolate lovers. I loved everything in this petit-four: intense dark chocolate flavor and the most amazing of all the textures in the base: crispy praline that explodes in your mouth just to melt immediately afterwards. Yesterday was a great day. My good friend Jamie came back to Hong Kong after 3 years! After studying in Hong Kong, she went to Oxford where she is now pursuing her PhD and we just hadn't had the chance to see each other till now! We went for Dim Sum in Tsim Sha Tsui and had a pleasant get-together with some other friends of hers. Here is what I was wearing. Let me know how you like it! Today I went to Elements in Kowloon to watch Hong Kong comedy Vulgaria (低俗喜劇) and have dinner at Caffe Habitu afterwards. We arrived a bit earlier to take some pics before heading to the cinema. I hope you like them! I've been so sad today at the news by mom has given me... We got robbed at our house in Barcelona last night. We suspect the assailants came in through the front door, which was just shut but not locked. Stunning as it is, the door was not forced, nor was the safe, yet everything is gone. From LV bags to cash and, most importantly, all our jewelry including some which had been in our family for a very long time. 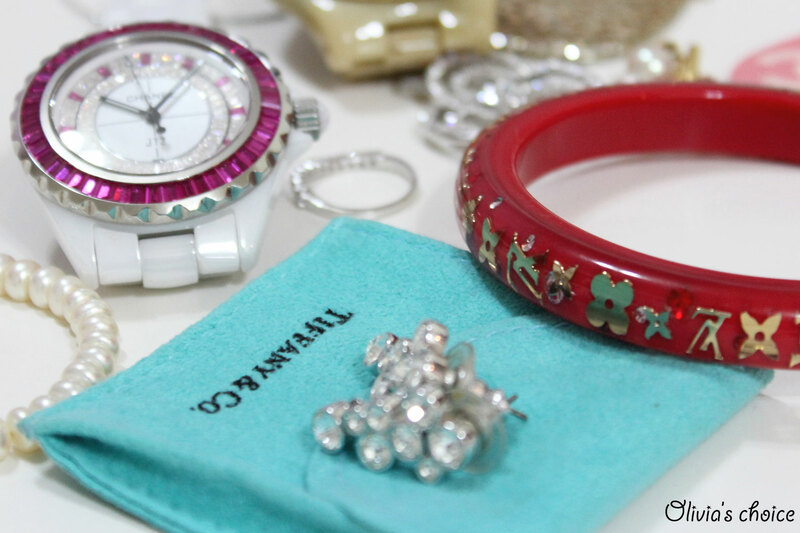 Some of our jewelry obviously carried sentimental value, and losing it has been rough to say the least. Our place was empty during the burglary, except for our fat cat who probably didn't even notice someone came in. The scientific police stopped by this morning and said the burglars were unfortunately wearing gloves, so they could not find any fingerprints. It is no secret that Hong Kong property prices are one of the craziest in the world. This week's Capital Weekly comes with a very detailed article by 陳可思 that will definitely make your eyes pop out. Hong Kong keeps its position as the world's second most expensive retail address, just after New York's 5th Avenue where the rents revolve around US$2,600 per square foot per year. Causeway Bay, namely Russell street, tops Hong Kong retail rents at above US$2,000 psf per year. Queen's Road Central in Central and Canton Road in Tsim Sha Tsui, cost an average of US$1,800 per square foot per year. In Causeway Bay, average store rental prices have gone up by 200% since 2010. Cosmetics retailer Sasa has just signed a deal to rent a 2,600 square feet store in Causeway Bay Plaza including ground floor and basement for HK$300,000 per month. 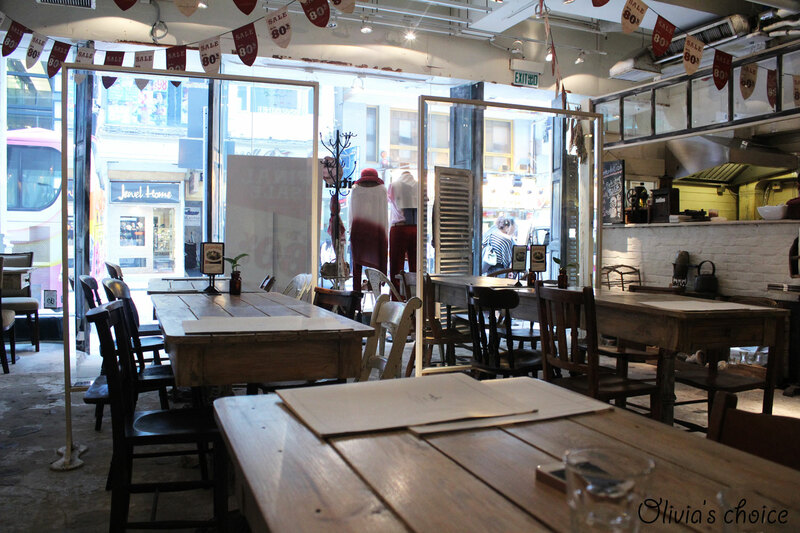 The current tenant is Walker Shop, who pays HK$190,000 monthly, which implies an increase in the rent of 58%. This deal at HK$115 per square foot per month is however considered "cheap" given the location of the store, where the market price in the ground floor is HK$500 more than what Sasa will pay. The main argument of this article in Capital Weekly is pointing out that with these escalating prices, retailers are either pushed to move to the periphery or to the basements. Hang Seng Bank pays HK$113 psf per month to rent the basement in 52-54 Queen's Road Central. Should it be renting the ground floor of the same street, the price would not be lower than HK$1,000 psf per month. Only the biggest brands are now bidding for leases in Hong Kong's premium locations. These brands view this a necessary investment given the Hong Kong awareness effect on the mainlanders. The most outrageous recent deal in the city is the one Zara just got to rent a 32,000 square feet (2,970 square meters) store in Central. This store is no other that H&M's flagship store in Hong Kong, in the Lane Crawford House. With this deal, H&M has just lost its flagship store to Spanish rival Zara, who will pay an astonishing HK$11M monthly. Yes, you read it right, eleven million Hong Kong dollars per month, or US$1.4 million. This is almost double the amount the Swedish chain pays for this rent since 2007. Zara will move into the store by the end of next year. Last Sunday I went to my favorite beach in Hong Kong. Chung Hom Kok (舂坎角) is one of the prettiest and most relaxing beaches in Hong Kong. 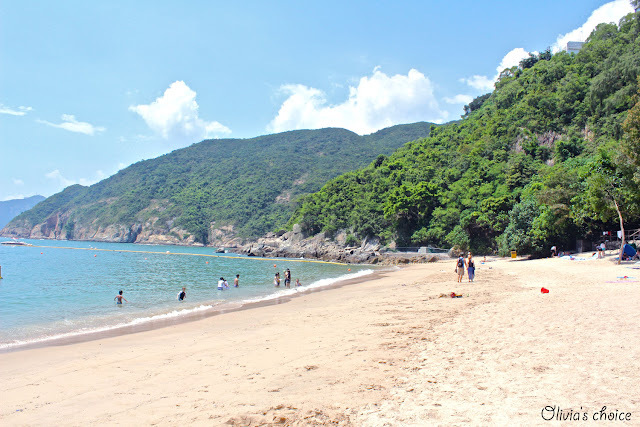 Located at the southest part of Hong Kong island, between Repulse Bay and Stanley, Chung Hom Kok beach is an inlet that cannot be seen from the road. If you want to go there by public transportation, take minibus 40 in Causeway Bay (Tang Lung Street) and get off at Chung Hum Kok beach. You can also take bus 65, although this one only runs on Sundays and public holidays! Once in the bus stop, turn right. At about 100 metres, you will see stairs going down. This is the way to the beach. In fact, Chung Hom Kok beach is surrounded by lush vegetation, so nothing can be seen yet from this point. I like this beach the most because it's extremely relaxing. 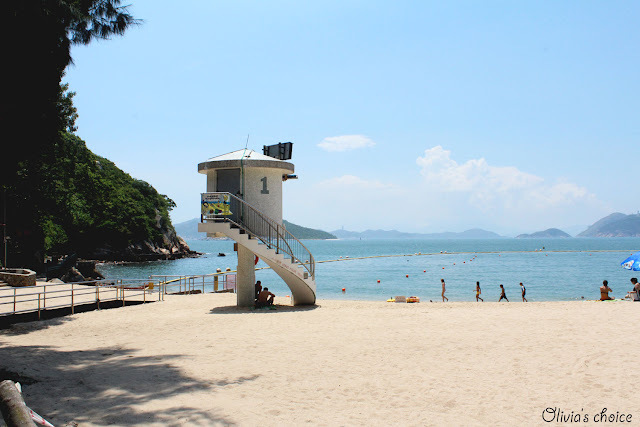 It has nothing to do with the busy beaches of Repulse Bay or Deep Water Bay. I guess less people know about it, since it's smaller and, in a way, hidden. I still hadn't been to this beach this year, since it's far away from my place, but the experience was as good as any previous times. The only drawback I need to point out is there were some rocks inside the water, which I found dangerous and annoying. There is a small store in the beach where you can buy snacks and rent a parasol for HK$80. Behind the beach there is a BBQ area that gets crowded with friends' get-togethers on Sundays. Ask any local what they think about Jenny Bakery, and most of them will tell you it has the best cookies in Hong Kong. Jenny Bakery originally opened in Stanley as a normal bakery, but soon started focusing on its highly successful cookies. They now sell cookies and cakes, but the cookies do definitely get all the attention. Jenny Bakery's cookies are buttery and full of flavour, yet made with natural ingredients and without artificial flavoring or preservatives. They come in cute tins in small or medium size, at HK$60 and HK$110 respectively. 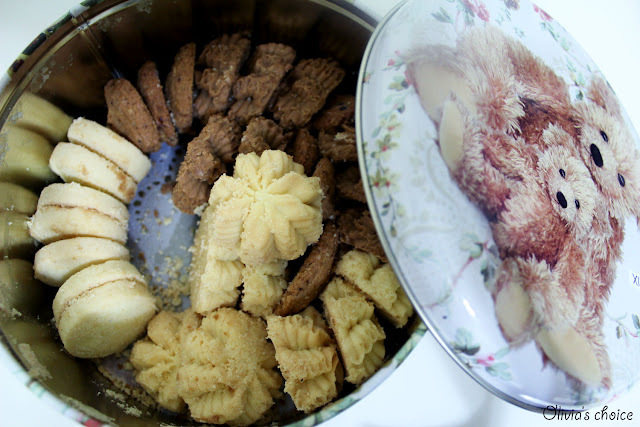 Their famous cookies are the Mixed Cookies Assortment, which come at either a mix of 4 or a mix of 8 different cookies. The 4 mix includes Shortbread, Butter, Coffee and Oatmeal Raisin. The 8 mix comes with Coffee Almond, Cashew Nut, Almond Poppyseed, Hazelnut Macadamia, Walnut, Pistachio, Mixed Nuts and Chocolate Chip/Cashew/Walnut. The 4 mix is the most popular option and my all-time favorite too! I love the Butter and Coffee cookies, with Shortbread coming in the third position, and not being a huge fan of the Oatmeal Raisin one. 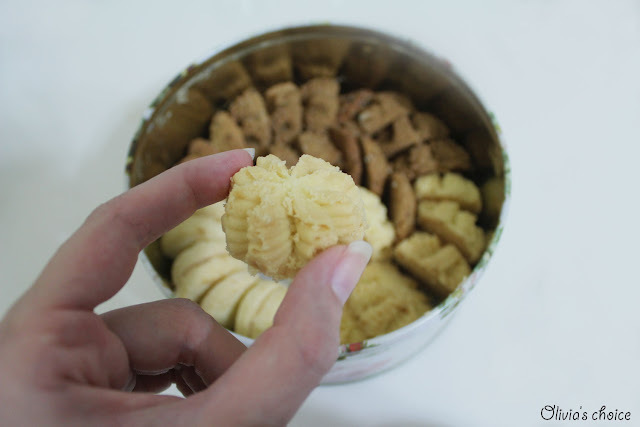 If Jenny Bakery was to produce a 2 Mix with the Butter and Coffee cookies exclusively, I'd be in heaven! 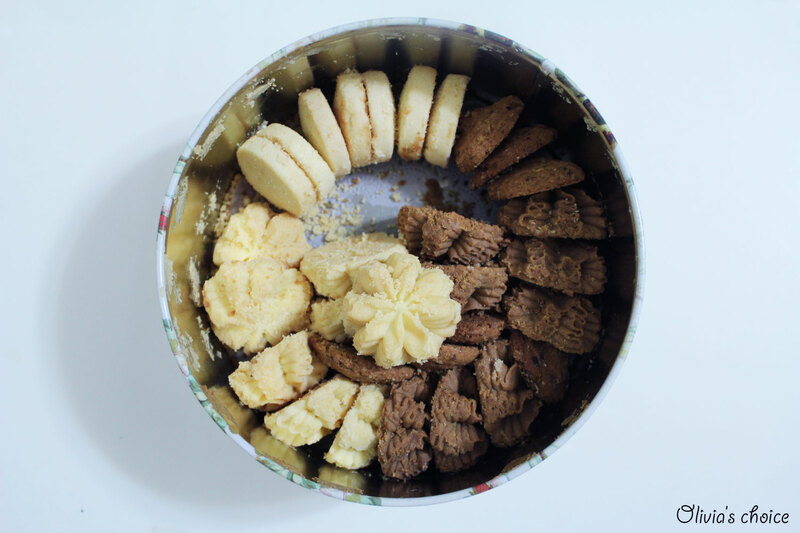 These two cookies just melt in your mouth, never mind if butter cookies are a Danish treat, these are still the best butter cookies I have ever tried! 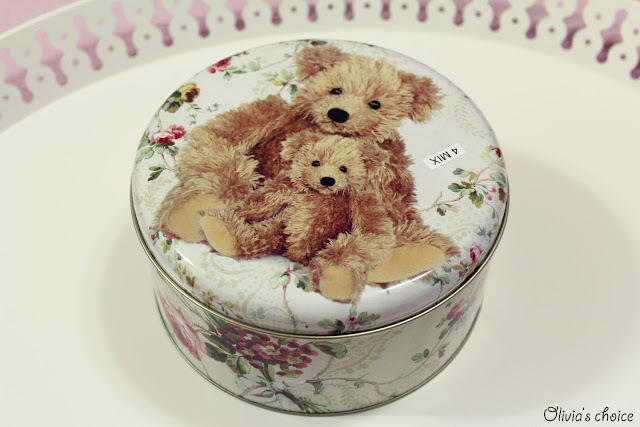 The cookies come two-layered inside the box. As you can see from my pictures, I had already eaten the first layer by the time I took my camera out! Fashion magazines: China edition. A must-read. As a Hong Kong fashionista, one cannot miss the chance to buy the Chinese edition of global fashion magazines. Our Hong Kong edition is a must-read too, of course, but we often tend to forget about the puissance of the country at our doorstep. 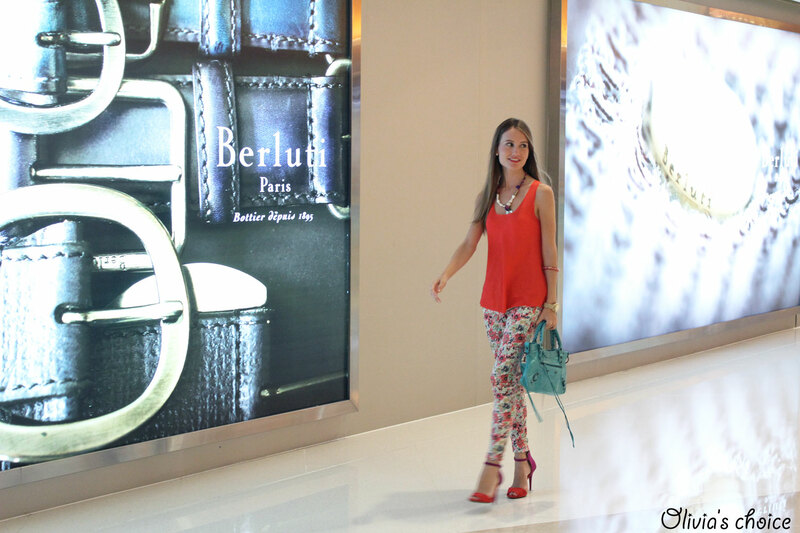 Magazines such as Vogue, Elle, L'Officiel or Bazaar, have made of the Mainland their top-one priority. It is no wonder: CLSA Asia-Pacific forecasts Chinese consumers will buy 45% of the world's luxury goods by 2020, making luxury brands more than willing to spend on advertising in the Chinese luxury publications. A recent report by Hurun Research Institute claims that 1 out of every 1,300 people in Mainland China are millionaires (have more than 1 million euros worth of assets), and the obsession of China's newly rich with high-end fashion and luxury brands is well known to all. With a population of over 1.3 billion, this makes almost 1 million Chinese millionaires! These fashion magazines in China have no trouble in getting revenue from advertising, which makes it not hard to guess why recently Chinese editions have been producing the best fashion photoshoots, shooting with the top Chinese and international models in the European fashion capitals, hiring the most renowned photographers, and coming up with a result that is envied by their sister titles worldwide. Because these magazines' concern is not funding but market reach, all they want is for people to actually read their magazine. The logic is simple: the more people reads a magazine, the more money brands will be willing to pay to advertise in it.This has resulted in a price war frenzy with high-quality issues priced as low as RMB10. I recommend spending a day per month in the Mainland, buying magazines, shopping and indulging yourselves in never-ending massages, all for less than you can imagine! In the picture, Elle China September 2012 edition, priced at RMB10. Elle China is now published by-monthly. 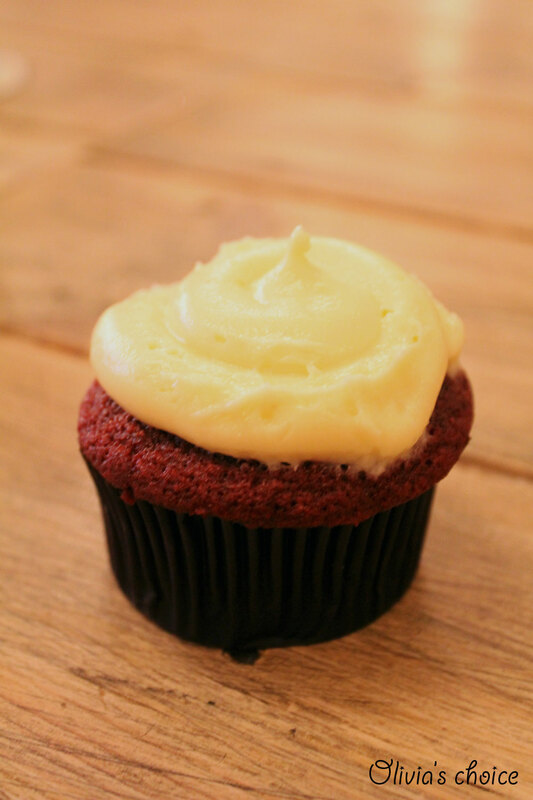 After having heard people raving about Sift's cupcakes and claiming Sift's to be THE Red Velvet Cupcake in Hong Kong, I had to go and give it a try. So last Thursday I made my way to Sift's Patisserie in Wan Chai and got my Red Velvet Cupcake. 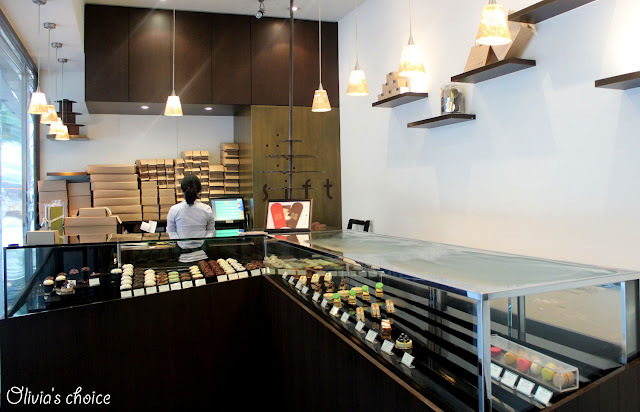 While in the store, I found out Sift not only has cupcakes but also all sorts of gorgeous petit fours. Well, what was my delightful suprise on this first-ever visit to Sift when I discovered a small tag on the counter saying "Ispahan: Homage to Pierre Hermé". You should know that my favorite treat in the whole world is Pierre Hermé's Ispahan. I couldn't believe my eyes! Even if there was nothing behind the label (the Ispahans were all sold out), I still couldn't keep my joy just at the thought of knowing the Ispahan existed in Hong Kong! I decided to go back as soon as possible to get hold of this divine treat, so there I was back again on Sunday. There were three Ispahans left!!! I got one and a Hazelnut Chocolate cupcake. A perfectly moistened cake, however lacking flavour. A cream cheese frosting that is not as tasty as it should be. Very good texture for both the cake and the frosting, but overall lacking chocolate flavour. A very good cake with enough chocolate flavour. 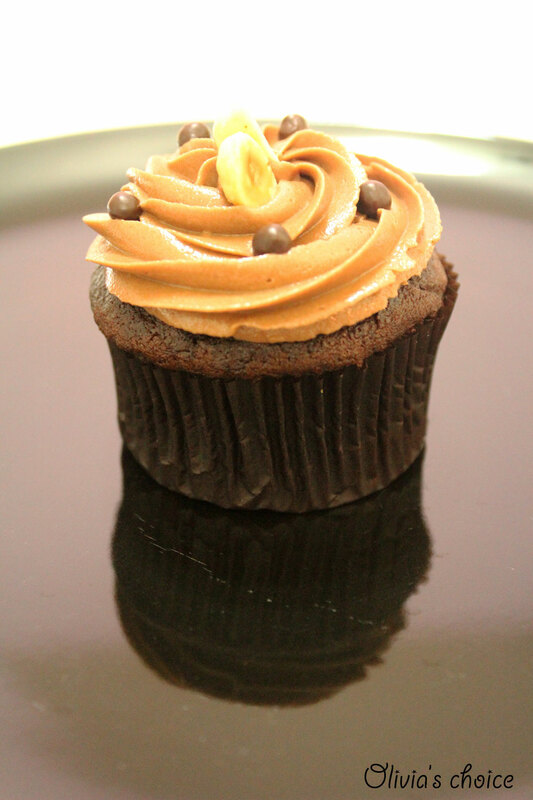 A frosting with strong hazelnut flavor, yet a bit too creamy. About the crunch part, I'm guessing it was the Valhorna chocolate pebbles that topped the cupcake. I personally would not repeat on this one. 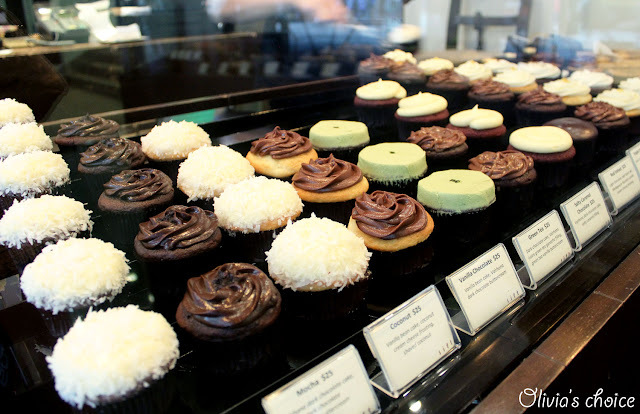 All in all, Sift Cupcakes feel very light. After eating one, you feel as if you hadn't eaten any, so two cupcakes per person for an afternoon treat is definitely the way to go. Finally, the masterpiece: this is heaven! It may not reach the perfectionist level of Pierre Hermé's, but it's certainly very close. Ispahan is one of Pierre Hermé's astonishing creations, consisting of a 7-cm wide rose macaron, filled with fresh raspberries, rose petals buttercream and lychee, topped with a fresh rose petal. 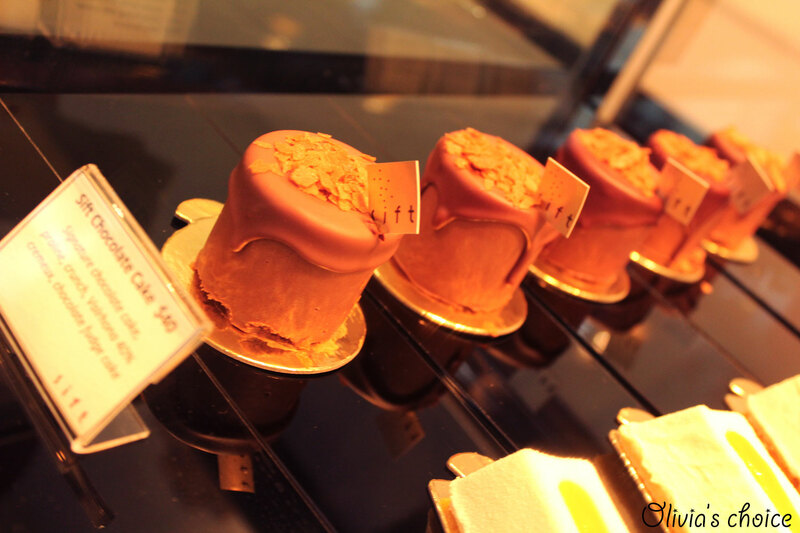 Nowadays other patissiers offer this on their repertoire, but the creation is to be attributed to Pierre Hermé exclusively. I was so lucky to live in Paris for a whole year and get to eat this so often. 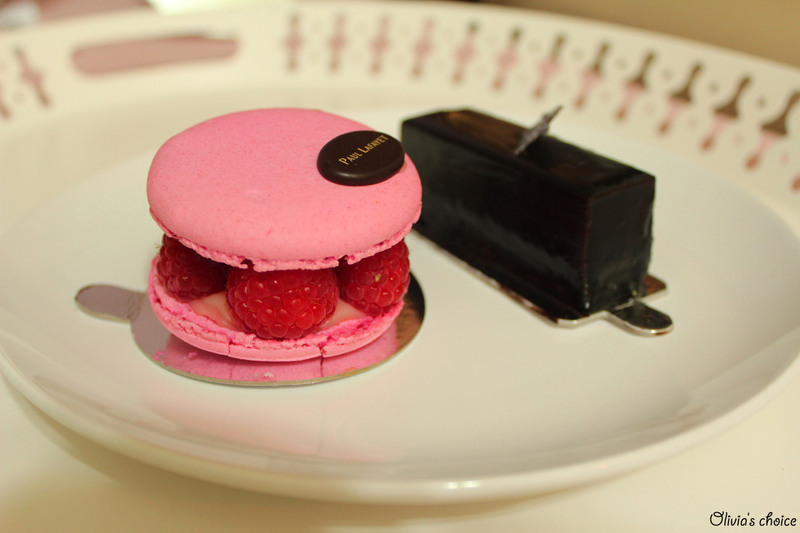 I probably had an Ispahan twice a month, and was always looking forward to go back! I would be so grateful if someone can tell me whether other patisseries in Hong Kong offer this exquisiteness called Ispahan. 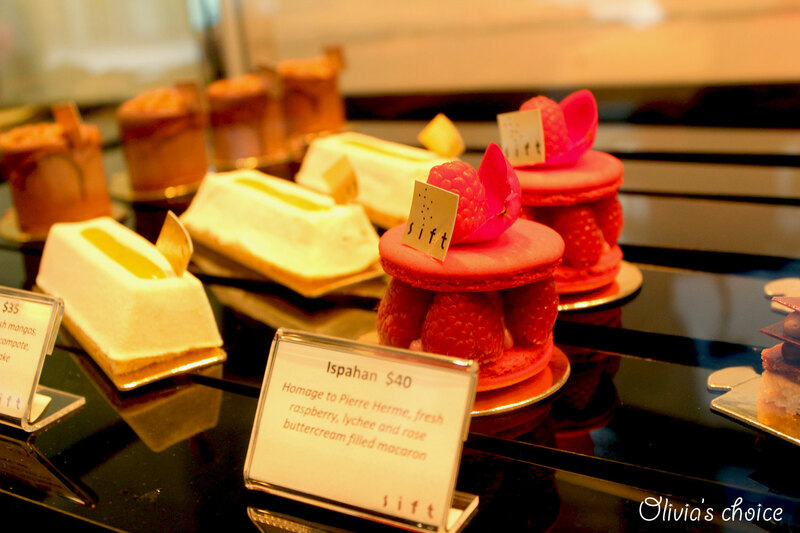 Meanwhile, until Pierre Hermé decides to come to Hong Kong, let me tell you, you can't miss out on this showpiece, so plan a short visit to Wan Chai, and pray for Sift to have an Ispahan left! 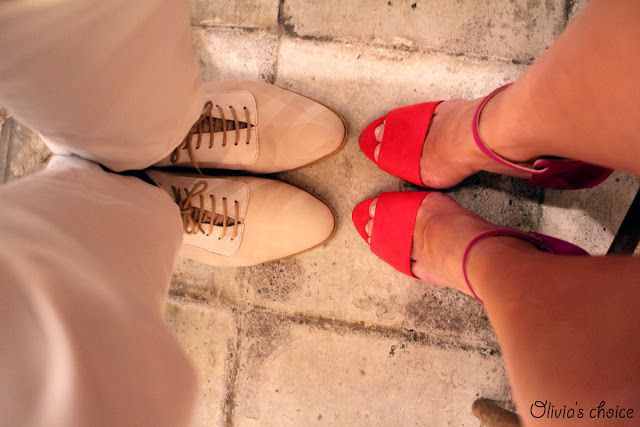 UPDATED: I found another Ispahan in town! Check it out here. Would I recommend it? Totally. 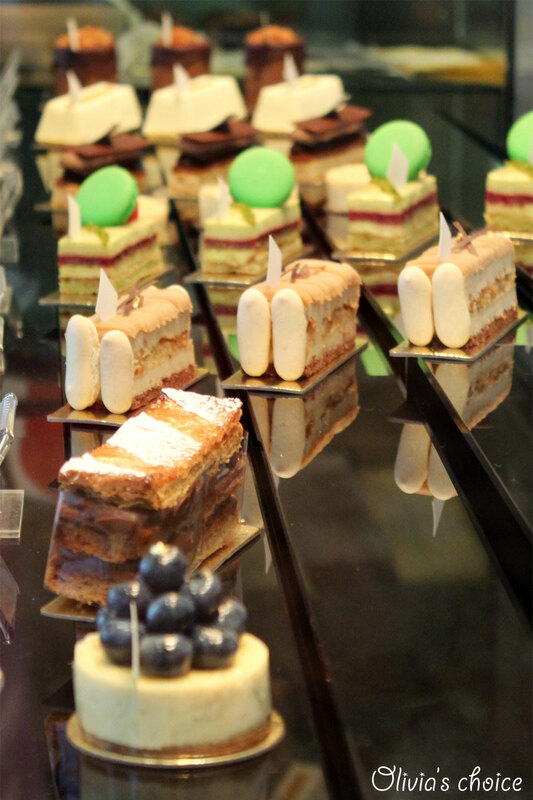 The cupcakes are very well priced, and the petit fours are delish! Sift has 4 locations in Hong Kong. 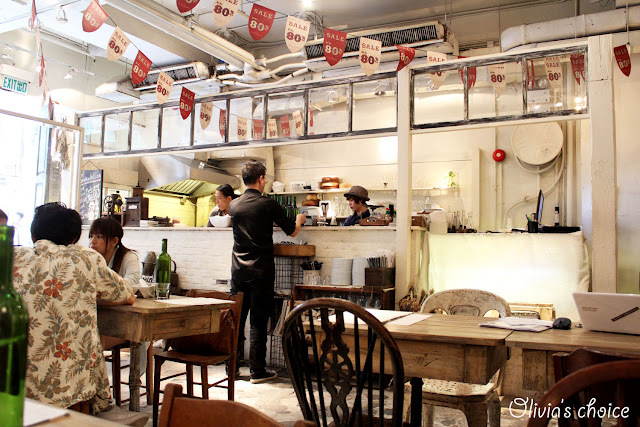 The one I visited in Wan Chai is the Patisserie were only take-away is available, but I believe the rest have at least a couple tables, with the one in Ap Lei Chau being the biggest with several white leather sofas for an unforgettable cupcake experience! I was exhausted today after going back home from LKF after dawn last "night", but I still managed to go for brunch in IFC and wander around in Wan Chai. I felt like wearing some comfortable and girly clothes, hence my pinky outfit! I matched it with one of my favorite pair of shoes from this season: the bow wedges by Melissa for Vivienne Westwood. Since I was in the area, I didn't miss the chance to visit Sift Patisserie in Wan Chai! Initial Cafe is one of the trendiest spots for a casual get-together in Tsim Sha Tsui. 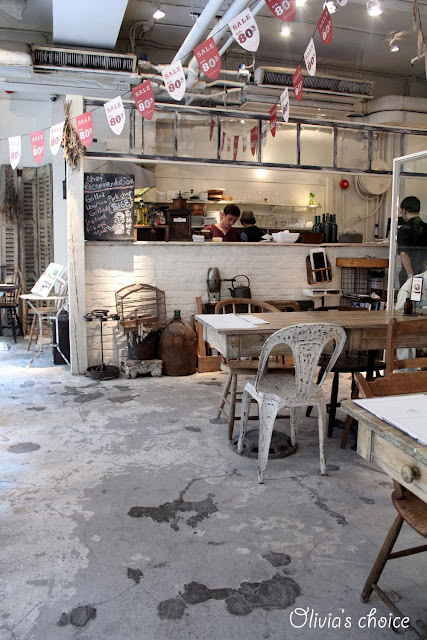 Two in one, cafe + fashion store, moneyed hipsters have made of this a place to call their own. Initial Fashion is an alternative fashion with Japanese inspirations, targeting eccentric Asian fashionistas in their twenties & thirties. Far from following fashion trends, Initial design is more of a timeless approach to fashion, all produced with the highest quality. Pricey as it is, do not miss the opportunity to visit any of their stores during the sales season: before the Chinese New Year and during summer, as almost all their prices drop to 50%. Now back to the Cafe, despite its bohemian style with a blowzy touch including cracked non-tiled floor, one should not be fooled to think the place needs some reconstruction work. 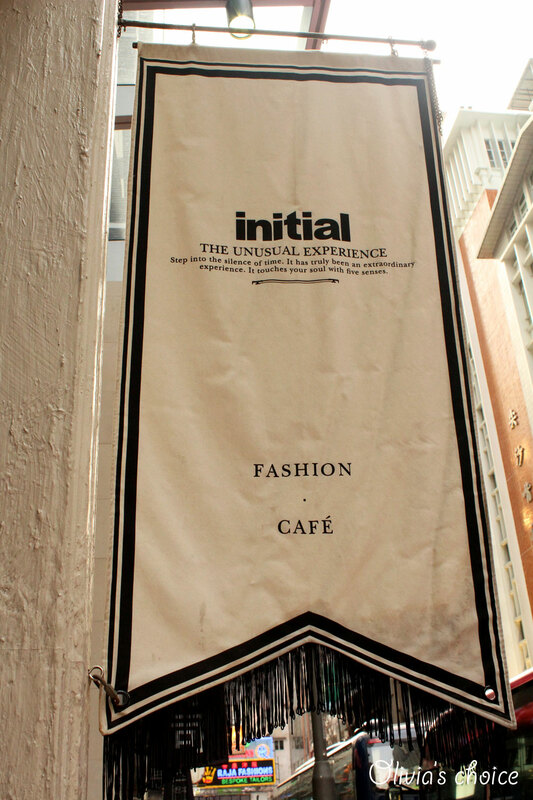 On the contrary, the décor at Initial Cafe is planned to the detail. It's the interior design version of those messy looks so often seen on fashion trendsetters, where nothing is left to chance, while the main point of the look is for it to seem all happy-go-lucky. 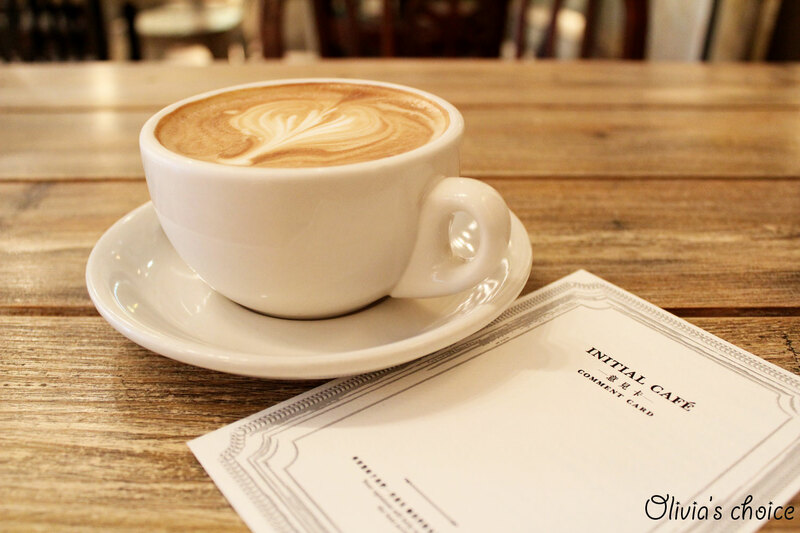 Excellent environment, presentation and service makes this a good choice for a relaxing reunion in the heart of Tsim Sha Tsui. I had the hot Designed Cappuccino (4*) while J had the iced Black & White Mocha (4.5*). Do I recommend it? Yes, the perfect spot for a shopping break!